Hello, fellow wedding professionals, friends and associates! The 2019 Sedona Bridal Show and Boot Camp will be held at Cliff Castle Casino and Hotel on February 2nd, 2019 from 10:00 to 3:00. Marketing has already begun! We are now on INSTAGRAM as Sedona Bridal Show and Boot Camp. Please follow us. If you are participating in the 2019 show, you may use the hashtag #sedonabridalshowandbootcamp. It helps market you and the show tremendously. Booth Registration is now open. This will be another sold-out show with limited space. Do not wait to reserve your space and risk being left out. If you are interested in being represented alongside the most recognized Sedona professionals and venues, you may begin building your Sedona presence by calling 928-203-9096 to place your non-refundable 50% deposit. 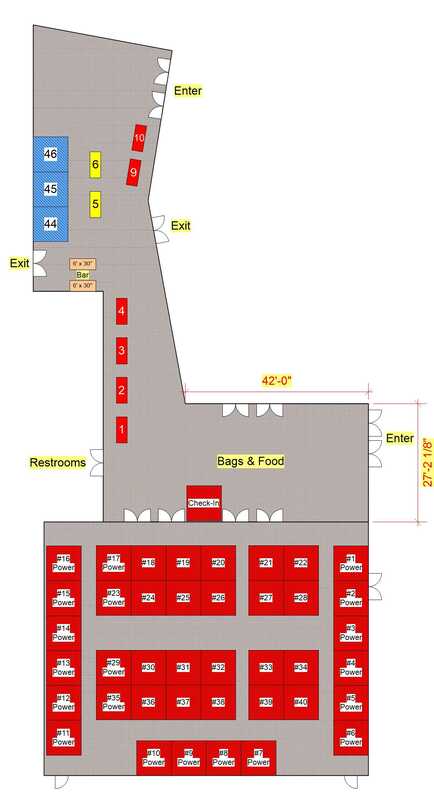 Booth locations are reserved on a first-come-first-served basis. Location can be requested but is not guaranteed. Floor plans are posted below and may be updated from time to time. Payment: Balance must be paid by November 1st or space will be forfeited. ♥ PLEASE LIKE US ON FACE BOOK ♥ Stay connected for exciting news and updates. Includes 8ft. rectangular table, basic linen, two chairs and a listing with link on the website. Booth space is approximately 8ft. wide x 8ft. deep and includes a 48in. round table with basic linen and two chairs. Rear draping provided for booths in the center of the ballroom only. Draping for booths along walls not provided. Includes listing with link on the website. Includes a 8ft. x 8ft. space, 48in round table, linen and two chairs. 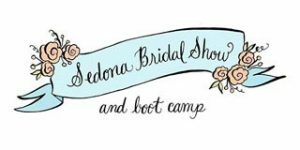 Sponsor’s logo (with link) will appear on the home page of the Sedona Bridal Show and Boot Camp website for approximately one year. Includes a listing with link on the vendor listings. Multiple property representations: 200.00 per property. Only one property or vendor may be represented in each booth. an additional booth. Only one vendor per booth. No booth sharing. No marketing material including cards, brochures, rack cards etc. may be display or distributed for any vendor or venue who is not participating in the show. No outside vendor product including flowers and food may be displayed or distributed unless the vendor is participating in the show. All booths using electricity will incur electrical charges. Electrical is only available in designated booths generally along perimeter walls. Electrical must be ordered in advance by Nov. 1st and cannot be ordered at the show. Electrical available along perimeter walls of the ballroom and pre-function area only. Only a limited number of booths will be available and will be sold on a first-come-first-served basis, so reserve your space today. Remember, there will be caps on floral / photography / photo booths and Djs. and these booths will sell out first. Additional information on set-up times, booth requirements and policies will be sent in December. **IMPORTANT: 250.00 minimum deposit is required to reserve a booth. Non-refundable. Balance to be paid by November 1st. By purchasing a booth, you are agreeing to follow our Guidelines and Rules as outlined below. Additional tables and booths that were added do not appear on this diagram. Please follow this link to our Participating Vendors Page to determine which booths have already been reserved. In order to provide a good mix, specific booth numbers can be requested but are not guaranteed. Booth numbers may be changed anytime at the discretion of show management. Please carefully read our Move-in Instructions / Guidelines and Rules BEFORE you purchase your booth. By purchasing your booth, you are formally agreeing to follow all our rules, guidelines and instructions. Hello 2019 Sedona Bridal Show and Boot Camp Vendors! Excitement is growing about the 2019 Sedona Bridal Show and Boot Camp to be held on February 2nd, 2019 at Cliff Castle Casino. We are the only bridal show in Sedona and have become the largest in Northern Arizona! This is because of your support and the diversity of top venues and exceptional talent. Make the most of Social Media! 1. Exhibitors are encouraged to make “unlimited posts” on the official Sedona Bridal Show And Boot Camp Facebook page. Please market yourself with posts on your own social media accounts as well. Be sure to always tag Sedona Bridal Show and Boot Camp and your own company so your posts can be shared. Our post reach last year was an impressive 3000 to 4500 per week depending on the number of posts made. Take advantage of this opportunity to let brides know your booth and table numbers and what show specials and discounts you will be offering! 2. Please “share” every post you see by other vendors and venues pertaining to the 2019 Sedona Bridal Show and Boot Camp. The more we all work together to market the show, the more brides will come. We have attached our logo, print ads, graphics and banner ads to this e-mail for you to use as much as you like. 3. Rack cards will be available later this summer at Sedona Wedding Services’ new location at Tlaquepaque, suite B.105 for those of you who would like to hand them out. Please contact us when you need more. 4. Please “Follow” us on our SedonaBridalShowandBootcamp Instagram account. We added a new level of marketing with paid Instagram ads that are already running. Make yourself visible with unlimited posts about your company using the hashtag #sedonabridalshowandbootcamp. 1. Electricity: Power requires an additional 50.00 fee and must be pre-ordered by November 1st. Existing outlets may not be used without authorization in order to prevent power overloads. Electricity may not be ordered at the show. Only perimeter walls in the ballroom and pre-function have available power. There is limited power available in pre-function area. 2. Display Height: Please keep all displays less than 8ft. tall. Displays over 48in. tall must be kept towards the rear of your space. An 8ft rectangular table /ivory linens / 2 designer chairs and an easel will be furnished. No signage or exhibitor badges will be provided. Create your own clever company badge to wear. Contact Deb Beggs at Bright Event Rentals well in advance for special requests (an additional charge will be applied.) 602-297-7198. 3. Equipment / labor: Please come prepared! Tools, carts, equipment, and labor will not be available. Do not ask show staff to borrow equipment or supplies. 4. Attaching displays: Pinning or taping to fabric draping or walls is not allowed. No push-pins tape or nails in walls. All displays must be free standing behind the table. No displays are allowed beyond front edge of table. There will be no pipe and drape structures for hanging. Plan your displays accordingly. All vendor booths must stay within an 8ft. wide x 6ft. deep x 8ft. tall space. Table displays in the lobby may not exceed more than two feet on either side or be over 8ft. tall unless approved by show management. Please do not exceed the limits or your space. You will be asked to comply. 5. Outside Vendor Promotion: No product may be displayed, distributed or represented unless it is from a paying participant in the show. This includes flowers, food, music, rentals, and any kind of promotion that would compete with vendors who are paying and participating to be in the show. Photo albums and photography representing your own work may be displayed but no photographers may be promoted with additional material unless they are exhibiting at the show. 6. Cross-over Services: Vendors may only promote and offer the services in the category they are registered under. Example: A planner or caterer may not offer floral services or rentals or any other services that are offered by another vendor. 7. Table Sharing: There will be no table or booth sharing unless previously approved by show management. Only one business or venue per table or booth, please. Promoting any businesses that are not paying participants in the 2019 Sedona Bridal Show and Boot Camp is not permitted. Plenty of space is available for those wanting to participate. Revenue pays for your marketing, not someone else’s. Note: Venues representing more than one property in a booth will be charged 200.00 for each additional property represented. 8. Lost Items: The Sedona Bridal Show and Boot Camp is not responsible for lost items. The doors will be locked at the end of the day on Friday but no security will be provided. No access after 6:00 pm. Rooms will re-open at 8:00 am the morning of the show, Feb. 2nd. 9. Candles: Open flames, candles, and incense are not permitted. distracting to other vendors. Promotional CDs may be played and distributed. 11. Serving Food: If you are serving food, you must have your food handlers certificate with you. Cliff Castle Casino does not allow you to pass out food or beverage unless it is an integral part of your business. For example, caterers and cake companies MAY pass out samples. However, a florist or coordinator etc. may NOT pass out candy or snacks. 12. Venue tours: Venues are asked to offer private tours of their properties only after the show ends at 3:00. It is important to remember that venue tours occurring during show hours (10:00 to 3:00) will draw brides away from the show thereby impacting other vendors. Show management and participating vendors will appreciate your cooperation. * If vignettes, displays, food etc. is needed for an on-site venue tour, we respectfully ask venues to show their support by partnering with those vendors who paid to participate in the 2019 show. * Please join us by showing your most fervent support in every way possible for those businesses who support the 2019 Sedona Bridal Show And Boot Camp, and whose investments helped pay for our great marketing. 1. Move-in will commence Friday morning, February 1st, at 9:00 am and must be completed the same afternoon by 6:00 pm. There will be no vehicle access Saturday morning except for caterers. You must set up on Friday to ensure opening on time when your brides arrive Saturday morning. If your booth is empty at 6:00 pm. Friday, it is a forfeit. No refunds. No exceptions. Vendors may enter the room on Saturday the 2nd beginning at 8:00 am. 2. Unloading: Please completely unload, then quickly move your vehicle to designated parking areas before you start working in your space so others can unload. Do not park in loading areas or leave unattended vehicles in front of doors or walkways. 3. Display vehicles: All limousines, trolleys, and jeeps must be in place by 9:30 Saturday morning. 4. Caterers: Please be set by 9:30 on Saturday, February 2nd and have food handlers license available. 5. Breakdown: Please take all personal items with you immediately after the show closes at 3:00. Clean up completely to avoid a minimum 25.00 per hour fee for cleanup of your space. Please cooperate and do not break down any earlier than 3:00 pm. It is disruptive to be hauling equipment in front of brides and other vendor’s booths before the show ends. 6. Bride’s Contact information: We do not provide contact sheets. You must take responsibility to get your own contact information from brides at the show so that you may promptly contact promising leads. It is appropriate to ask brides if you may contact them afterwards. They will appreciate the courtesy. Do not bother brides who do not want to be contacted. Some brides do not want to be solicited for services they might not want or need and have. Many brides purposely give wrong e-mail addresses and phone numbers. Non-registered walk-in brides could go uncounted, so be prepared to get your own contact information from all brides. 7. Please do not share bridal contact information. Your valuable time and money helped pay for this event and, as participating vendors, they are your contacts alone. 8. Prizes and Show Specials: Prizes and special show discounts guarantee that brides will visit your booth and provide their correct contact information, which will help to sell your services. Prominently display your show specials and prizes so brides will see what you are offering and stop by your exhibit. Again, don’t underestimate the power of social media. Advertise your show specials by posting them often on Facebook and Twitter. (See Marketing #1 & #2.) Brides are reading them and are already registering. Thank you for participating in the 2019 Sedona Bridal Show and Boot Camp. We hope you have a fun and successful show! Together we can keep this tradition going and continue to make our Sedona Wedding Industry grow. WRAP PARTY: Bright Event Rentals cordially invites all vendors to join show management for a fun wrap party immediately after the show in the lobby.